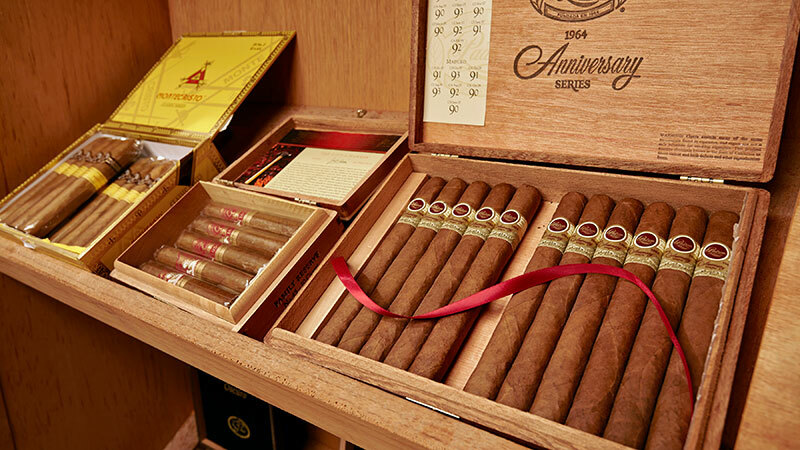 Explore our expansive humidors, and discover the many varieties of cigars we have available! In addition to our normal cigar menu, we also offer a few limited-availability options from time to time, so be sure to ask us what new cigars we have available whenever you visit. Cigar menu selections subject to change due to availability. A Connecticut wrapper with a sweet Madagascar vanilla start and a knock out finish. Showcasing a creamy Cameroon wrapper leaf over the brand’s signature infused blend of long-leaf tobaccos, the Acid Blondie Red just may be the smoothest Acid experience yet. A trademarked infusion process by Drew Estates lends this large gauged robusto a silken, creamy taste with an aroma of incense and spice. A flavor powerhouse featuring the same aromatic infusion as the original Kuba Kuba, but with a chocolatey Maduro wrapper that adds some rich sweetness to the mix. Acid Cold Infusion natural tea cigars are a mild, aromatic Connecticut shade wrapper. Rich notes of peach cobbler, and the aroma of fresh cut pine. A perfect quick smoke. The C-Note is a mild smoke, packed in bunches of five. These cigarillos are a great choice if you’re pressed for time, yet insist on a great flavored cigar. This box pressed Aging Room limited edition cigar is full bodied with an Ecuadorian Habano wrapper and Dominican Habano filler and binder. Complexity and flavor distinguish this rare stick. Featured on Encantador’s face is a high-priming Ecuadorian Habano wrapper leaf, dark and chock-full of oily goodness. Lying just beneath, Dominican binder and long-filler leaves intertwine in sturdy, box-pressed fashion. Bold, rich notes of white pepper, honey, oak, and spice excite the palate from first light. The combination of Ecuadoran Habano wrapper and Cuban-seed tobaccos has all the dynamic range of an operatic performance, hitting baritone notes like earth and ripe fruit, all the way to bright soprano tones of spice, ending with a midrange nutty finish. This classic is a favorite among Fuente fans, due to the easy draw, fine flavors, well proportioned construction and Connecticut broad leaf wrapper that is naturally sweet. A gorgeous, elegant smoke. Nice oils, creamy and toasty hints of nougat, wood and cocoa. The oily, dark, toothy wrapper is a testament to how much a wrapper can affect the flavor. It is a favorite among smokers, with a sweet spice and intense leather notes. Strong leather and cinnamon notes are accompanied by hints of pepper and a pine nut finish. Bold, complex and satisfying. A long time Nicky’s favorite. This cigar is perfectly aged; the oils simply drip out of the stick. Strong, complex and amazing. These cigars are wrapped in a gorgeous Rosado Sun Grown wrapper that has been aged 8-10 years. Complex flavors that go from nuts to cedar to leather, with some sweetness to balance the smoke. Casa Cuba blends a golden-hued brown Ecuadorian wrapper with the delicious Dominican binder and filler. This unique blend provides flavors similar to the Opus X line in a medium bodied format. Dominican tobacco aged 4-5 years and wrapped with a Connecticut broadleaf, then again aged for one extra year. An amazingly smooth, medium-bodied delight. The Ashton Classic is an all around great cigar that has a great appearance, produces an excellent burn, flavor, and draw. A mild cigar with pleasing flavors of nuts and sweet wood. Take this opportunity to try this premium cigar. Ashton VSG Illusion cigars present all of the powerful, intoxicating flavor and aroma of the VSG line in a Lonsdale size. What makes these cigars so special is the wrapper leaf grown exclusively for this line on the Oliva family’s private estate in Ecuador. A hard-to-find cigar that’s a rare treat. This robusto is soft and oily with hints of alfalfa and orange peel, rounding off to light brown sugar finish. A mature, medium-full bodied smoke with lots of peppery spice. Aged with a resting period that ensures a mature, satisfying cigar. This new release features a dark and oily, Ecuadorian Connecticut wrapper, a Dominican binder, and aged filler tobaccos from Nicaragua, the Dominican Republic, and Peru. Medium to full bodied in flavor, this complex cigar offers notes of sweet cream, cedar, roasted nuts, and leather. This cigar captures the sweet and spicy flavors from the rich, volcanic soil of Nicaragua and blends them with the soft, creamy notes of the finest Dominican leaves, resulting in a smooth and balanced box-pressed cigar with unexpected depth and complexity. Sweet vanilla and cedar dominate a complex floral essence. A masterpiece from Avo. A medium-bodied Camacho cigar, as opposed to their fuller-bodied offerings but certainly does not skip out on the flavor. The Cubano filler is perfectly encased in a special 1998 Criollo wrapper, which means it’s already aged to perfection. A mild-to-medium bodied blend that combines their prime Honduran long fillers with additional filler grown in the Dominican Republic. Camacho Connecticut is a spicy, yet not overpowering, smoking experience. Barrel Aged secret ingredient is Camacho’s legendary Corojo leaf aged 6 years and then skillfully fermented in charred Kentucky bourbon barrels. This is a bold, delightfully aromatic smoke, oozing with warm lingering tobacco flavors, with subtle hints of bourbon imparted by this special fermentation process. This full-bodied cigar features a blend a complex mix of Dominican Piloto Cubano, Honduran Corojo, and Nicaraguan Corojo leaves that have been aged in Flor de Cana rum barrels for 5 months. Never bitter or overpowering. Expect clouds of white smoke full of earthy flavors, producing a remarkable aroma laced with unsweetened cocoa and coffee on a long finish. Only 300,000 were produced. Each Flathead cigar contains a flavorful Nicaraguan filler. A smooth, yet spicy Ecuadorian Habano CT binder, and a Connecticut Broadleaf Maduro wrapper to add sweetness and balance out the spicier Habano binder. This cigar features a beautifully handmade medium to full-bodied blend, filled with rich, smooth Nicaraguan tobacco and wrapped in divine brown Brazilian leaves. Rated 92 by Cigar Aficionado, this medium-bodied cigar is wrapped in a fine Cameroon leaf. A rich, spicy-sweet, remarkably constructed box-pressed cigar. This creamy robusto is loaded with flavors of vanilla and nutmeg. Highly regarded for its flawless construction, it captured a 90 rating from Cigar Aficionado magazine. Designed for the ‘seasoned’ cigar smoker, CAO uses two aged Maduro wrappers with a rich, complex blend that combines the best tobaccos from six different countries. The outer wrapper is a Connecticut Broadleaf Maduro, while the inner wrapper is a Brazilian Maduro leaf. They surround a sweet and spicy mix of tobaccos from Nicaragua, Honduras, Peru and the Dominican Republic. Turning back the clock, the company is employing an old 19th century Cuban method of tobacco fermentation, called the circular pilon. In a circular pilon, the tobaccos are meticulously placed in a circular pattern that ferments the tobacco at a slower rate of speed, thus enhancing its maturation and flavor. An amazing full bodied cigar. A deeply satisfying cigar, rich in flavor that does not overpower the smoker. Great construction and medium-bodied flavor from the outstanding name of Cohiba. Featuring a gorgeously smooth Honduran wrapper which will wake the palate up right off the bat, the Cohiba Blue is filled with a three-country blend of Nicaraguan, Dominican, and Honduran tobaccos that are all held together by a Honduran habano binder. This new gem is an inviting medium-bodied blend that is rife with rich hints of sweet leather, earth, cream, and cinnamon. This is high quality full-bodied cigar for the experienced smoker. Burns great with a lovely layered ash and is perfect after dinner cigar. This cigar features a Connecticut Havano wrapper, a Connecticut broadleaf binder, and a combination of Dominican and Nicaraguan fillers that have been aged four years. In the final year, the tobacco is fermented in rum barrels to add an extra dose of flavor to the notes of wood, white pepper, cedar, and coffee that this fragrant cigar produces. Honduran sun grown Oscuro, this proprietary Cohiba blend is lush to the core making for a spicy, feisty boldness, but still surprises with a touch of sweet. And in classic Cohiba style, the Nicaragua smokes cool and creamy to the finish. Medium to full bodied. This cigar is milder in flavor than the full-bodied Davidoff Grand Cru series, yet more pronounced than the subtle Davidoff Classic Series. Every cigar contains the same perfectly balanced blend of Dominican tobaccos and flawless, even-toned Connecticut wrappers. A medium bodied, creamy smoking cigar, beautifully crafted. A flagship cigar by all standards. Made in honor of Zino Davidoff’s 80th birthday, the No. 1 and the No. 2 are characterized by surprising lightness dominated by a rich, intense aroma. The Aniversario No. 3 has an even more distinctive aroma, is fuller in body. Creamy wood flavors settle nicely on top of a complex cinnamon mocha core. This 91 rated cigar is tremendously rich with a warm nice finish. This full bodied cigar starts with a 10-year-aged Cuban-seed Nicaraguan Rosado wrapper. This vintage leaf is spun lovingly around a blend of long-filler tobaccos hailing from Nicaragua’s premier growing regions of Esteli, Condega, and Ometepe. This complex core is then concealed by a rich Jalapa binder, kicking the level of complexity up another notch. Davidoff Double R cigars are creamy, full-bodied, handcrafted smokes with the finest Dominican tobaccos patiently harvested over the course of four years. Each is encased in a luxurious Connecticut wrapper for a captivating aroma and silky finish. Winston Churchill cigars are created by Davidoff of Geneva to honor of the legendary British politician who was the Prime Minister of the United Kingdom. This line has a full-flavored luxurious smoke with lavish notes of almonds, wood, sweet cream, and caramel. The cask aged Nicaraguan Condega Visus tobacco, together with the two different Dominican Visus filler tobaccos and the dark Mexican binder, unravels the complexity of this full-bodied blend. Beautiful, robust flavours of black pepper, dark coffee, sweetness, old leather, wood and spiciness tantalize the palate. This amazing cigar presents the aficionado with an appetizing appearance, in colour, shine and oiliness. Davidoff Yamasá begins with an immediately noticeable, spicy Nicaraguan taste. Beautiful flavours of nut, melted with spice, coffee, cedar wood, earth and black pepper notes further delight the aficionados palate. The cigar has a deep and complex body that slowly reveals itself. Ask your server for the special Limited Edition cigars we currently have available in our humidor. Toasty and creamy, with a fine burn and notes of vanilla and anise. A medium-bodied, well crafted cigar. A mild cigar with complex flavors. The Maximus holds smooth flavors of moist earth and coffee beans. A top five ranking in Cigar Aficionado for multiple years. This smoke’s wrapper, grown in the rich volcanic soils of Ecuador, features an Ecuador Havana seed filled with a blend of 100% Dominican tobaccos. Carefully aged for five years, these have a bold, rich distinctive flavor. The expertly rolled, medium-bodied Drew Estate Undercrown Robusto is a combination of truly unique and extraordinarily delicious, rich, and spicy flavors. A top quality medium-bodied cigar. The Shade is lighter bodied than the original and features an Ecuadoran Connecticut wrapper. Below deck sits a Sumatran binder and Dominican Criollo, Nicaragua Criollo and Corojo fillers. This recipe offers superb flavor that flourishes with lavish notes of nuts, sweet cream, and toast, with subtle hints of warm spice and honey. Enrobed in an Ecuadoran Sumatra wrapper grown in open sunlight, this cigar contains a stalk-cut binder from the Connecticut River Valley and filler from Nicaragua. The cigar contains one leaf of aged ligero from the Nueva Segovia region of Nicaragua, which was added to the blend for strength. Herrera Esteli has, after lots of trials, tweaks, and trips to the tobacco stash, earned all sorts of accolades from cigar publications and fans of sweet-and-savory smokes. Lots of zesty flavor is both contrasted and complemented by a super-smooth body, making it a great selection for all kinds of smokers. 94 rating – Cigar Aficianado 2014. For available sizes and prices, please ask your server. The Gurkha Cellar Reserve 21-Year is the fifth installment in the limited edition Cellar Reserve line, with exclusive 21-year-old aged Dominican filler tobacco and a Connecticut shade wrapper. Full-bodied cigar with a very complex taste, combining hints of barley and caramel. A Dominican and Nicaraguan filler, a Dominican Criollo 98’ binder and a Brazilian Arapiraca wrapper. This new iteration of premium handmade cigars feature an Ecuador Habano wrapper, a Honduran binder, and aged long fillers from the Dominican Republic and Nicaragua, with a medium-bodied profile and engaging flavors of roasted nuts, caramel, leather and hints of spice. The Gurkha Royal Challenge is a smooth- to medium- bodied cigar that is smooth and complex. The blend is highlighted by an aged, silky Connecticut Ecuadorian wrapper, a Honduran Habano binder, and is perfectly complimented by Nicaraguan and Dominican long fillers. This addition to the Excaliber line is creamy and reminiscent of a mocha. The coffee, cream, cocoa, and earth flavors are accented by hints of black pepper. The Excalibur line, the cream of the Hoyo de Monterrey crop, is wrapped in a beautiful Connecticut shade wrapper giving them a robust but exquisitely smooth taste. A Full-bodied cigar with outstanding flavors. A cigar with a rich and full flavored aroma. Made with Honduran, Nicaraguan & Dominican long filler as well as Honduran binder and Ecuadorian wrapper which produces a bold, full flavor. These cigars use a premium blend of 100% Habano seed tobaccos from Nicaragua and a Cuban-seed Ecuador wrapper, for flavors that rival those great pre-embargo Cuban cigars of years gone by. The smoke is full flavored, bold, highly aromatic, and loaded with dark spicy tobacco, earth, mocha, caramel, creamy leather, and toasted almonds. A medium-bodied, smooth cigar. Offers notes of almond and a small sweet finish. With a pigtail and a shaggy foot. This triple dose of Habano dishes out medium-to-full-bodied smoke exuding hints of leather, spice, roasted nuts, and a spicy-sweet finish. Due to popular demand and limited availability, specific cigar selections for La Flor Dominica may vary. A powerful blend of Dominican longfiller and binder leaves finished in silky Ecuadorian wrappers. A host of full-bodied flavors, with a spicy and strong finish. With a dark and oily Brazilian Maduro wrapper, a Mexican San Andres binder, and the classic LFD Dominican ligero long-fillers, La Nox is certainly potent. These full-bodied beauties are spicy, robust, and bold, yet smooth, sweet, and complex with notes of cedar, caramel, roasted nuts, and coffee. A well balanced yet full-bodied maduro cigar. Surprisingly, rich flavor without being harsh. A consistently wonderful smoke. This natural Ecuadorian wrapper provides an enjoyable medium-bodied experience that gave it a 98 rating in Cigar Aficionado. This very limited edition cigar is made in Miami’s Little Havana by only 10 rollers. A medium to full body with a unique shape that smokes like a chimney. The newest addition to the Serie R line, this cigar is a lighter version of its predecessor. A medium-bodied, dark natural cigar that smells of leather and spice. Overall an excellent cigar. A mellow smoke with black cherry and espresso finish. An easy, light smoke. This panatela is smooth and mild with notes of burnt honey and cinnamon. The wrapper and binder are both Honduran which help to give the cigar a more “down to earth” taste. With Nicaraguan and Honduran tobaccos as the filler, expect to get some spice to go along with the earthy tones. Bringing a fresh dark look to the roster, this gem showcases a full-bodied blend from Nicaragua, covered with a rich and oily Connecticut Broadleaf wrapper. The richness and complexity of this top-notch smoke is beyond compare, emitting a tapestry of dense flavors that include spice, dark chocolate, coffee, nuts, and cocoa. Mellow to medium body in strength and creamy smooth like its famous original cousin, Inspirado rewards the palate with a uniquely modern flavor profile of dry wood, sweet cream, some earthiness, cocoa, and just the perfect hint of spice. This limited collection uses a rare 1997 Connecticut Broadleaf maduro wrapper. Tapered at both ends with a metal ring lends to the elite status of this cigar. By far the best Macanudo we have ever encountered. Rich and full. A box pressed version of the Classic No. 2 cigar. A staple amongst cigar smokers, this elite cigar needs no introduction. A medium to full-bodied experience. A new edition to Montecristo, the Epic series boasts the highest standards of quality control and inspection by the “Master Group.” A light wrapper with a little spice. These rare gems from the Dominican Republic feature aged Nicaraguan filler tobaccos, a binder from the Dominican Republic, and a velvety smooth Ecuadorian Sumatra wrapper, with rich flavors of dark tobacco spice, earth, cocoa, cashews and leather. Medium to full bodied in strength, these flawlessly rolled cigars deliver a stout, chocolatey flavor and aroma, accented with notes of coffee, roasted nuts, and a heavenly caramel sweetness. The Platinum La Habana Series cigar provides Montecristo lovers with a bolder, richer smoke. Wrapped in a dark, Mexican Cubano leaf, the well balanced blend of Dominican, Nicaraguan, and Peruvian long-leaf fillers. A rich and well rounded smoke, this mild cigar has hints of cedar and lots of smoke. Handmade in Nicaragua, these deep, dark beauties contain aged long fillers jam-packed with intense flavors. With a spicy binder and a Habano Oscuro wrapper, the combination provides a full-bodied and unique Cuban-style smoke. A tasty Ecuadorian Connecticut shade wrapper along with meticulously aged Nicaraguan Corojo 99’ binder, and Nicaraguan Habano and Criollo long-fillers, deliver a splendid sweet and velvety flavor with earthy nuances. An amazing smoke with a full-tilt array of flavor swirling throughout your palate with undeniable hints of earth, toasted cedar and black pepper. The aftertaste and aroma are sweet, pleasant, and completing. This Nostalgic cigar is comprised of a variety of exceptional, Cuban-seed tobaccos lovingly tucked inside a flawless, oily, dark brown Sun Grown wrapper leaf of the highest quality. A medium bodied box press beauty. It’s big. It’s bold. And it’s box-pressed. With an Ecuadoran Sumatra-seed wrapper, two Nicaraguan binders (Corojo and Criollo) and filler from three of the Garcia family farms, this cigar is deserving of its #7 spot in the Cigar Afficionado Top 25 List for 2017. Habano wrapper, robust full-bodied and complex. Cameroon wrapper, medium-bodied with an oily cedar flavor. Connecticut wrapper, light and creamy, with a kick in the background. Maduro Connecticut wrapper, fullest body in the nub line. Strong and dark. Thought by many to be the finest cigar made by Oliva, this cigar is constructed with a luscious sungrown broadleaf wrapper leaf and a Nicaraguan blend of Habano-seed, ligero tobaccos. The result is a beautiful, dark brown cigar that’s bursting with complex, balanced flavor that satisfies the palate with a rich, full-bodied finish. A Top-5 cigar on the Cigar Afficionado Top 25 List for 2017, the Oliva Serie V Torpedo is a superb Nicaraguan cigar masterfully rolled and blended to deliver a full-bodied taste. Complex and well-aged tobaccos from Nicaragua, and a stunning and savory Habano Sun Grown wrapper delivers creamy coffee and dark chocolate flavors, further enhanced with a fragrant, smoky bouquet. Beneath this leaf, a flavorful blend of long-leaf ligeros from Nicaragua unites, including the Oliva’s oldest, most prized leaves from Condega and Esteli, along with some extra tobaccos from Jalapa for more flavor and aroma. Each Melanio is full-bodied and full-flavored, with unique nuances such as black pepper, freshly-baked bread, and unsweetened cocoa. A legendary name made entirely of Nicaraguan tobacco and box pressed. This stick is sweet and leathery, with hints of cocoa and traces of pecan. A classic taste of Rocky Patel. The blend comprises an 11-year-old Mexican wrapper from the prominent San Andrés region, along with Nicaraguan fillers and a Connecticut Broadleaf binder. The result is a spicy, medium to full bodied smoke with a rich, leathery finish. The Edge A-10 celebrates the 10-year anniversary of the original Edge brands by combining the Corojo and Maduro wrappers in a unique barber pole-style combination. The result is an exceptional flavor combination that pairs the sweetness of the Costa Rico Maduro with the earthiness of the Honduran Corojo. The light version of its sister maduro. This exquisite cigar is as mild as can be. A great addition to The Edge series. With premium, flavorful tobaccos and sporting expert construction, the 20th Anniversary has the makings of a legendary cigar. Your palate will be dancing with flavors of leather, espresso, cinnamon, mocha, earth, wood, pepper, and light spice. Sun Grown Maduro features a sun ripened USA Connecticut Broadleaf wrapper and an aged all Nicaraguan blend of binder and filler tobaccos. This triple capped beauty offers complex and well balanced notes of coffee, dark chocolate, sweet spice and caramel. Its fragrant bouquet and lush medium to full-bodied taste will have Maduro lovers stand up and take notice. The 1999 is a tasty combination of vintage 7 year aged Nicaraguan and Dominican Ligero long filler sheathed in a silky, mild Connecticut wrapper. The Rocky Patel Vintage 1999 blend is a smooth and flavorful medium-bodied smoke. Using a similar blend as the 15th Anniversary, this Nicaraguan blend is smooth and earthy-sweet where the 15th is strong. A mellow take on Rocky Patel cigars. Rated 91 in Cigar Aficionado. An oily, chewy robusto with nuances of cinnamon and dark earth. A relatively new edition to Romeo y Julieta, the Romeo series with its dark natural wrapper is bold and hosts multiple layers of flavors. Its complexity is an experience like few others. The first-ever Romeo y Julieta cigar made in Nicaragua, these deep, dark, and delicious puros are expertly crafted with wrapper, binder, and filler tobaccos from Esteli, Condega, and Jalapa— the country’s three top growing regions. This richer, fuller bodied Romeo is a splendid full body smoke brimming with the rich, sweet, nutty, and spicy flavors that represent the finest characteristics that Nicaraguan tobaccos have to offer. A soft, musky smoke with a mild, floral sweetness and honeyed finish. Unique, rich profile of sweet wood, brown sugar and leather. A favorite in this series. Short and sweet, with flavors of creamy butter and sweet hay. A well layered and constructed smoke. The Chubby, or Perfecto, Z-Crown features a Semilla 253 Yamasá wrapper, a Dark Ecuadorian Connecticut binder and a filler blend that includes San Vicente Seco Damajagua, San Vicente Mejorado Visus Mao, Piloto Mejorado Seco Martím Garcia & San Vicente Visus Navarrete filler. The Z-Crown Stout, or Torpedo, features a Semilla 702 wrapper, a Ecuadorian Sumatra binder and a filler blend that includes Semilla 192 Seco Yamasá, Piloto Seco Santiago Rodríguez, Piloto Visus Piloto, San Vicente Ligero Jicomé & Ometepe Visus filler.